Pop. 55. In McGillivray T., Middlesex C. on C. Rds. 5 & 81,10 km N of Parkhill. It was named for an early family that settled here in 1843. The post office opened in 1873. Pop. 989. In McGillivray T., Middlesex C., Reg. Mun. of North Middlesex on the Ausable R. and C. Rds. 7 & 19,40 Ian NW of London. Pop. 111. In Middlesex C. on C. Rd. 20, 26 km. NW of London. John Matthews and 34 other immigrants from Wales founded the community in 1821. Pop. 107. In Middlesex C. on Hwys. 4 & 7,1 km W of Hwy 23,24 km NW of London. Pop. 332. In East Williams T., Middlesex C., on the Ausable R. and C. Rds. 17 & 19, 36 kID NW of London. Donald McIntosh, an agent of the Canada Land Company, established the village and built mills. Pop. 8. In Stephen T., Huron C., on C. Rd. 10,9 km SE of Grand Bend on L. Huron. 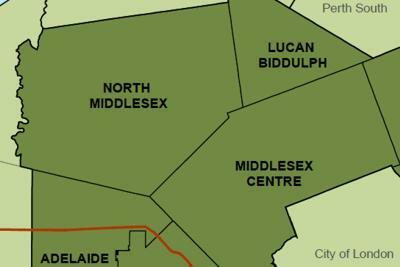 The name first appears on an 1879 map, but the history of the community and origin of its name have not been recorded. Pop. 1,001. In Bosanquet T., Lambton C., on L. Huron at the mouth of the Ausable R. and Hwy 21 and C. Rd. 81, 69 km NW of London. Pop. 5,282. Town in Bosanquet T., Lambton C., 35 km. NE ofSarnia, created by Regional Government in 1995. Pop. 38. In West Williams T., Middlesex C. on C. Rd. 7, 47 km. NE of Sarnia. Pop. 817. In Bosanquet T., Lambton C., on C. Rds. 6, 7 & 79, 51 km NE of Sarnia. Pop. 512. In Bosanquet and Warwick Ts., Lambton C., on C. Rds. 12 & 79, 56 km. E ofSarnia. Asa Townsend settled in 1821. The community was fIrst called Eastman's Corners because many families named Eastman had settled here. Pop. 171. In Stephen and Hay Ts., Huron C. on C. Rds. 2 & 83,61 km. W of Stratford. Absolom Fried came from Waterloo C. in 1860 and built a grist mill and sawmill. Pop. 380. In Stephen T., Huron C., on C. Rd. 10,6 km. W of Hwy 4,43 km. NW of London. Pop. 1,886. In Flamborough T., Reg. Mun. of Hamilton-Wentworth on Bronte Cr. and C. Rd. 536,3 km. E ofHwy 6,15 kIn NW of Burlington. Pop. 120. In Flamboro T., Wentworth C, 19 km NW of Hamilton. Named for Strabane, Ireland and shown on a 1916 map as Strabane Court. Pop. 179. In Bosanquet T., Lambton C., on the W shore of L. Huron, 42 km. NE of Sarnia. Pop. 1,000. In Bosanquet T., Lambton c., on L. Huron, 6 km NW ofHwy 7, 18 km N of Forest. Pop. 700. In Bosanquet T., Lambton C., on L. Huron at the original mouth of the Ausable R, 2.5 km N of Hwy 21, 64 km NE of Samia.